Each lab completed first in simulation and then on the real "Launch" board, using the Keil tools. Topics (More Details Follow Topic List) of Labs to Review Embedded Systems while not working, the area I had worked in for 18 years. 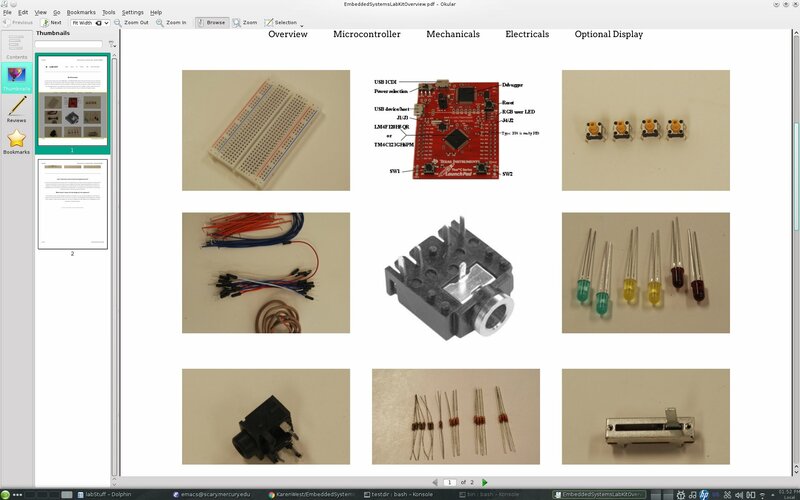 Ultimate Goal of course was to have an small systems approach to game design, to design and test a retro-hand-held-vide-game, integrating all labs from the class into this final thing, which was optional, and in the process, learn about microcontrollers. I opted to do all the labs, but have not yet put them all together into this form. 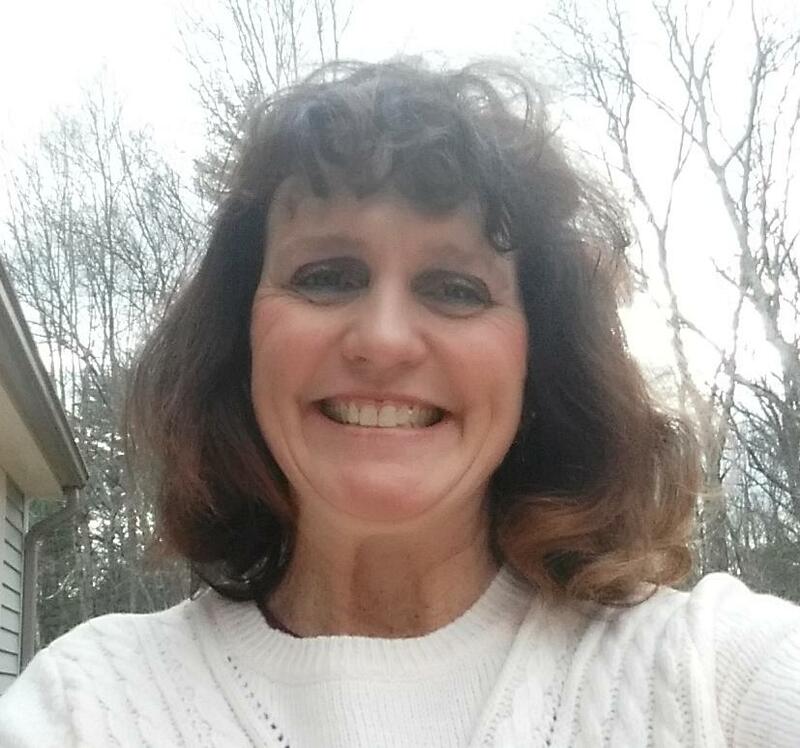 I have an example of what it would be like if I did. 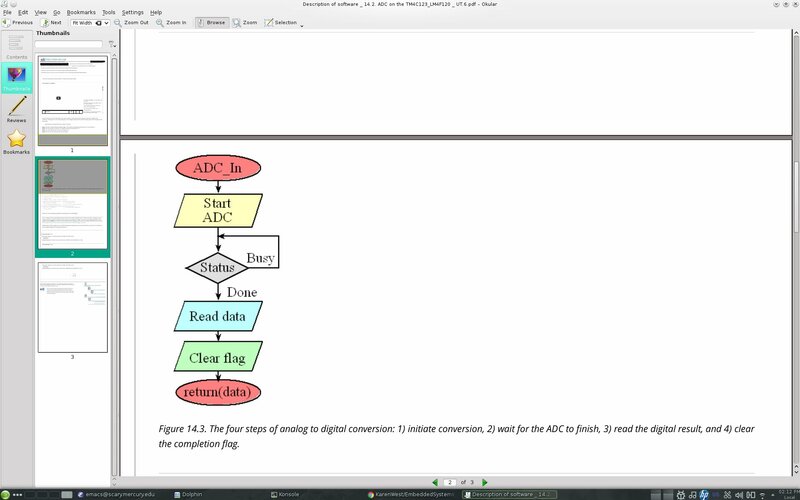 ADC (Analog to Digital Conversion) and Data Acquisition: We developed a system that inputs an analog signal with an analog to digital converter within the microcontroller. 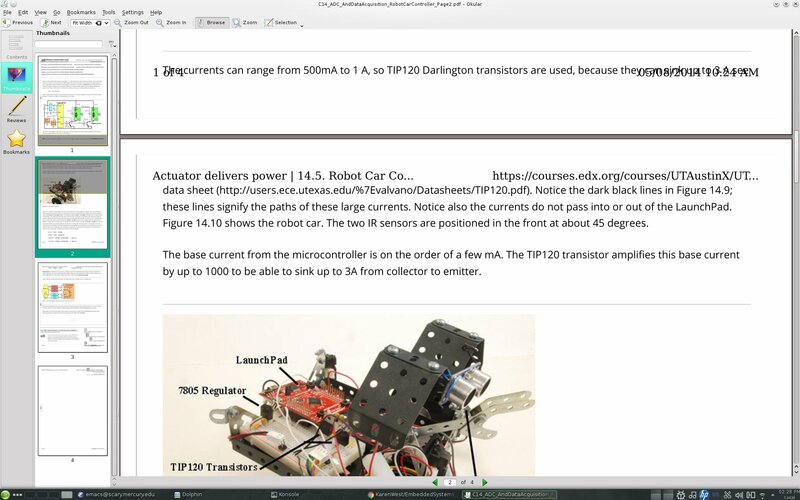 We developed a simple autonomous robot that used two DC motors and two distance sensors. We designed and tested a position measurement system, with analog to digital conversion and calibrated output. DAC (Digital to Analog Conversion) and Sound: We developed a system that outputs an analog signal with an R-2R digital to analog converter. We design and tested a digital piano, with 4 inputs, digital to analog conversion, and sound. Interrupts: We developed a system that outputs a square wave using interrupts, followed by developing a system that inputs from a switch using interrupts. 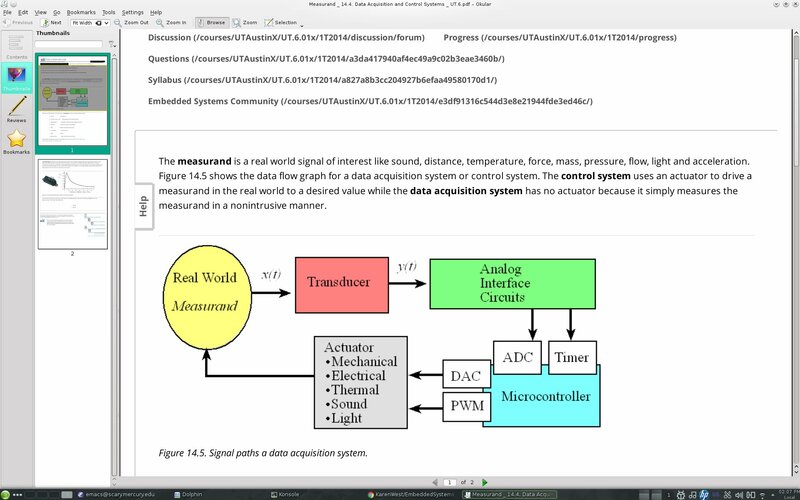 We developed a system that outputs to a DC motor using pulse width modulation. We designed and test a guitar tuner, producing a 440 Hz tone. UART (Universal Asynchronous Receiver Transmitter) - The Serial Interface and I/O Synchronization: We developed a communication network using the serial port. We Wrote C code to output decimal and fixed-point numbers to the serial port. Finite State Machines: We developed a simple vending machine using a finite state machine. 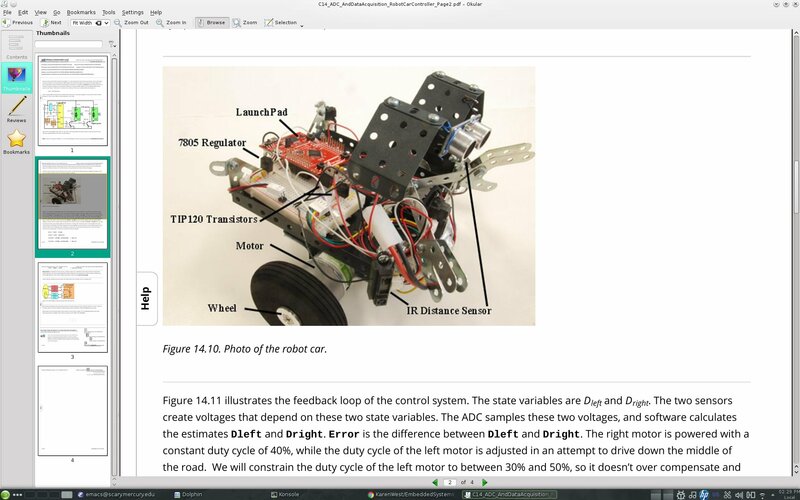 We developed a stepper motor robot using a finite state machine. We interfaced 3 switches and 6 LEDs and created a traffic light finite state machine. Arrays and Functional Debugging. We developed a system that debugs by dumping data into an array. We Wrote C functions using array data structures that collected data to debug our system. The most pervasive method for designing the ADC in this microcontroller is successive approximation. A 12-bit successive approximation ADC is clocked 12 times. At each clock another bit is determined starting with the most significant bit. For each clock, the successive approximation hardware issues a guess on Vdac by sitting the bit under test to 1. If Vdac is then higher than the input bit Vin, then the bit under test is cleared. 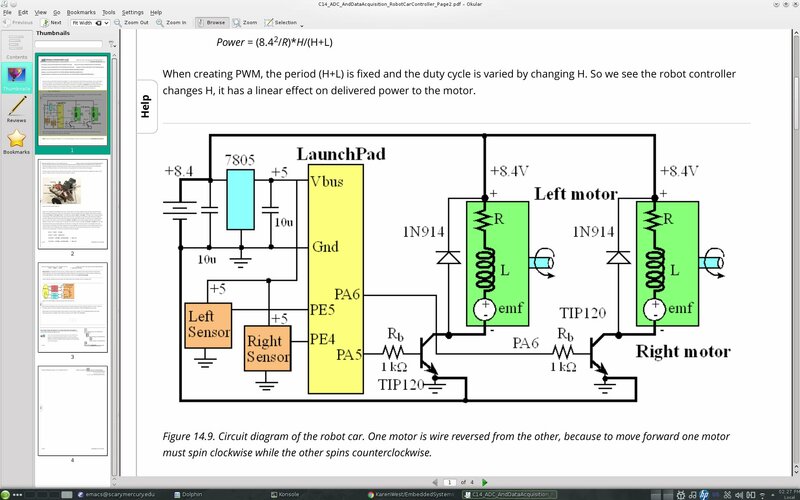 If Vdac is less than Vin then the bit under test remains 1.
used SysTick interrupts to implement a software PWM (pulse width modulator) to drive two DC motors at variable duty cycles. Two analog IR (InfrRed) distance sensors: used to allow the robot to follow a wall. The two IR sensors are mounted looking forward to the left and forward to the right. The goal is to control power to each wheel so the left and right distances to the walls are equal. A third IR sensor looks directly forward to attempt to avoid a head-on collision. If an object is detected too close to the front of the robot, both wheels are immediately stopped. 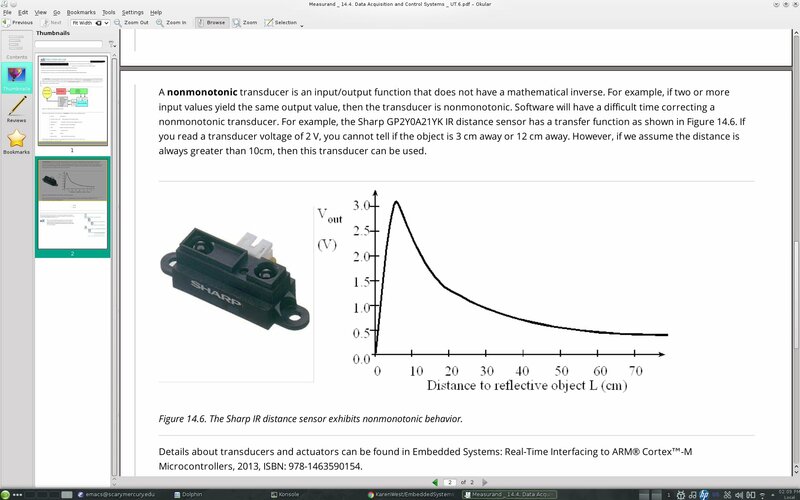 "|-ROBOT------|--->direction of motion and third sensor"
A linear slide potentiometer converts distance into resistance "(0 <= R <= 10 kiloOhms)". 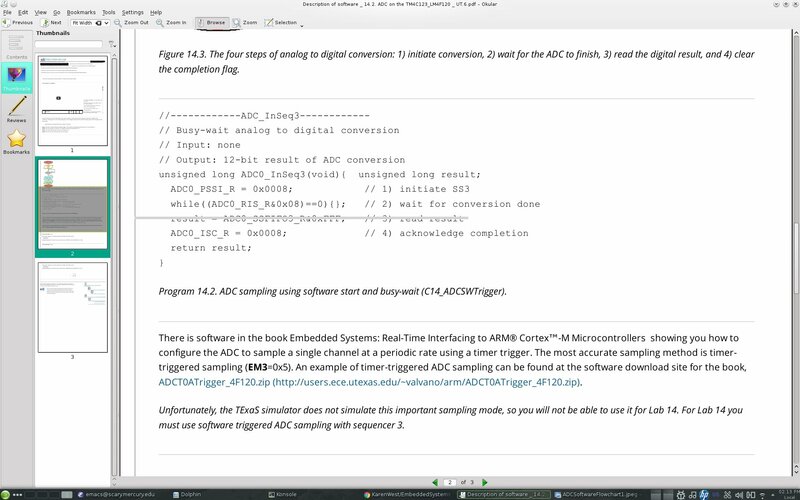 The software uses the 12--bit ADC in microcontroller sampled at 40 Hz using SysTick interrupts. A function converts the ADC sample into distance: units of 0.001 cm. Data stream: will be passed from the ISR (interrupt service routeine) into the main program using a mailbox, and the main program will output the data on a display. 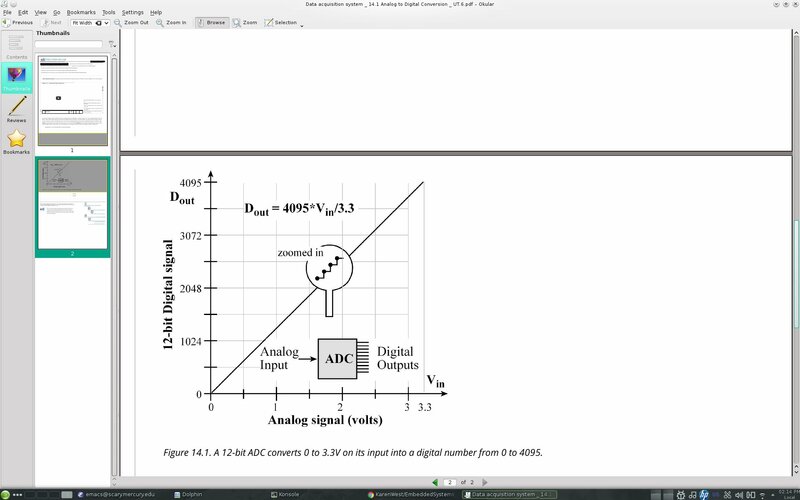 Microcontroller ADC: input from potentiometer: converts the input voltage to a number from 0 to 4095. The ADC is a successive approximation device with a conversion time on the order of several microseconds. 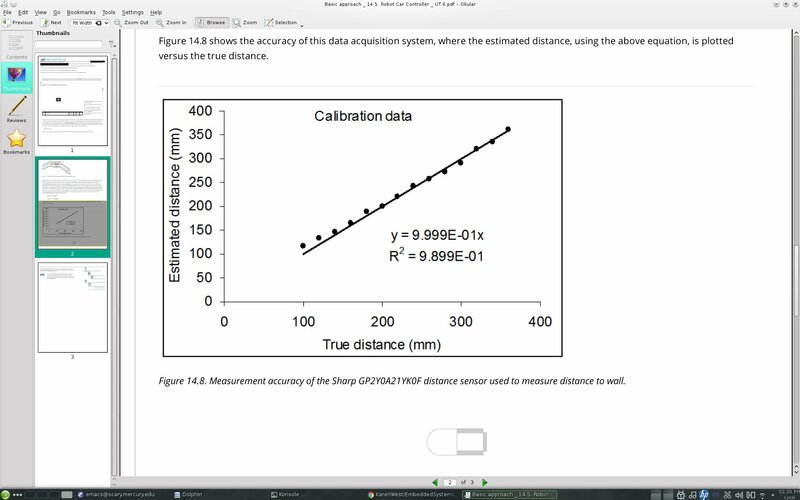 Software: calculates distance with a resolution of 0.001 cm. Position measurements: should be displayed on the Nokia display through UART0. A periodic interrupt can be used for the real-time sampling. Distance resolution: smallest change in distance that the system can reliably detect. Resolution depends on electrical noise, number of ADC bits, and the resolution of the output display software. Accuracy is defined as the absolute difference between the true position and the value measured by the device. The armature is defined as the part that moves, and in this lab we were measuring the position of the armature, which in this lab is the slide potentiometer. 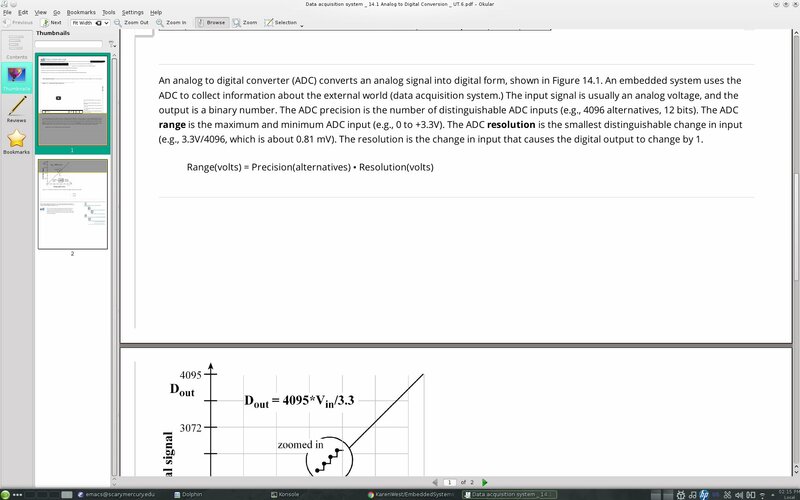 In this class example, we created a sine wave analog output from digital inputs using an R2R 3bit design for the Digital to Analog (DAC) conversion. 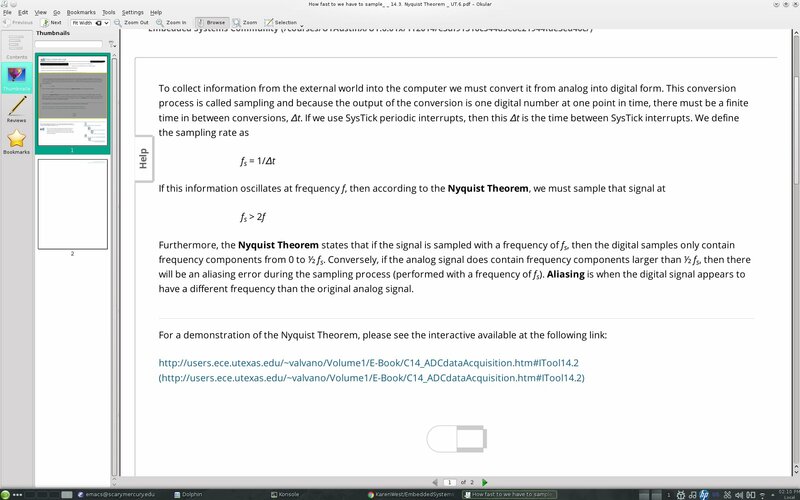 We had to generate a 100 Hz sine wave whose table size was 16 entries of integers that when sent to the output port would create the various levels of the sine wave, so we needed a 100Hz*16 = 1.6 kHz interrupt. Each time the SysTick interrupt handler was run it output one of the 16 voltage levels that created the output sine wave. The bus is 80MHz, so SysTick period was 80000kHz/1.6kHz = 50000 for the sine wave. Each time the switch was pressed, it either activated playing this 100Hz sound wave, or stopped it. The lab created a 4 note output digital piano. 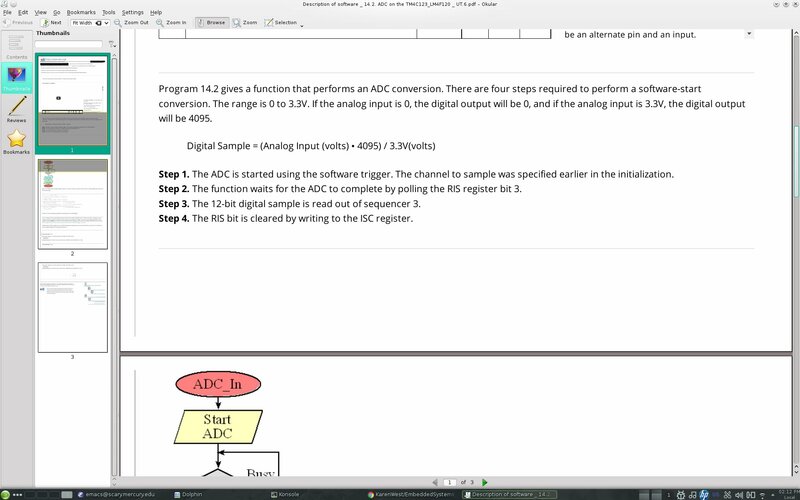 The DAC is 4 bits, but the example we did in class was 3 bits. 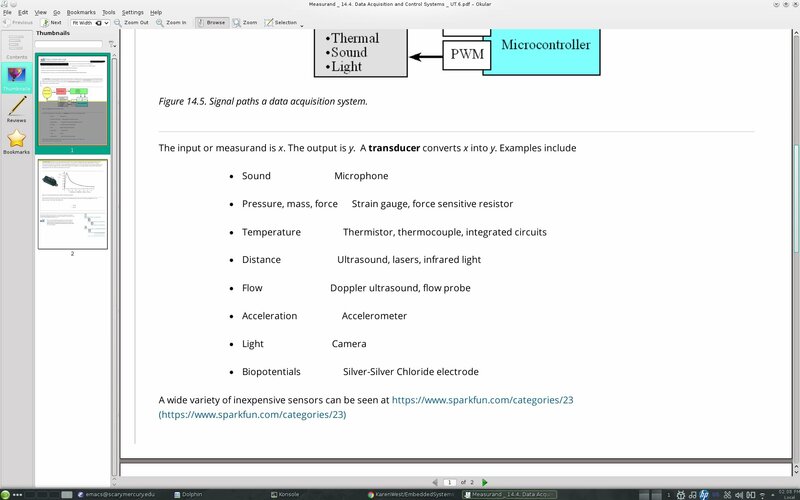 This class example used the SysTick timer to request interrupts at 500Hz. It helped prepare us to do the tuning fork example at 440 Hz. The square wave sound is 440 Hz, a standard frequency made by a tuning fork. A positive logic switch was the input, and headphones were used as an output. A resistor placed in series with the output to the headphone speaker controls the loudness (larger resistor, quieter sound, but never go off). Pressing the switch: the square wave sound begins, press it again, it stops. When the output was oscillating, the period was 1/440 sec = 2.2727ms, so interrupt at 1/880 Hz = 1.13636 ms. The time "t" between touching a switch and the change in output need not be immediate, as long as the toggling begins before the next SysTick interrupt. The resistance of the headphones is 32 ohms, and Power (P) = Volts (V) * Current (I), and the output high voltage is 3.3 volts, and the in series resistor from the output to the headphones is 1500 ohms. So the current delivered to the headphones was: I = 3.3 / (1500 + 32) Amps. The power delivered to the headphones should be less than 1 milliwatt, and with P = I**2 * 32 ohms, with R = 1500 ohms, the power delivered = 0.15 mW. Sound was created only when the voltage across the speaker oscillated. The frequency of the oscillation will determine the pitch of the sound. Frequency 440 Hz: note A, above middle C on the piano. To output silence, it requires less energy to leave the output low. An unchanging output results in no sound from the speaker, but it also requires current to flow through the electromagnet in the speaker. The PLL(Phase Locked Loop): runs at 80 MHz. With the SysTick interrupt, we found that timing was more accurate than software loop delays, and creating the 440 Hz wave with the 880 Hz interrupt worked better. 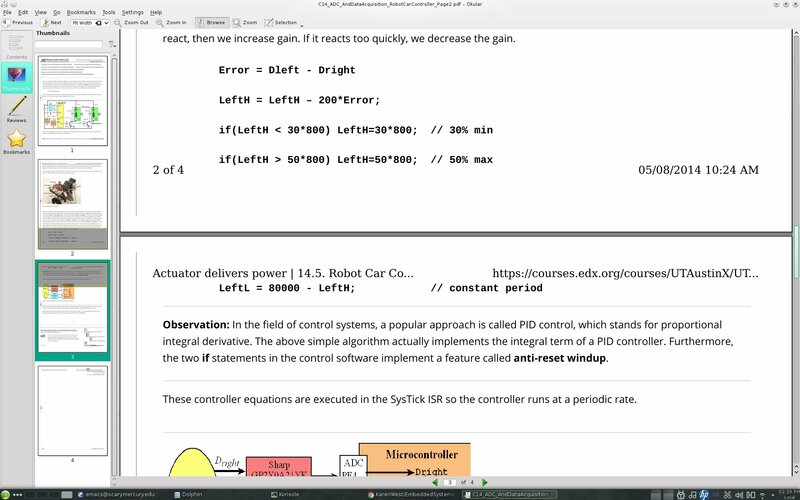 SysTick interrupt service routine: looked at the state of switch and tracked whether the switch was pressed during the previous ISR service to know whether to toggle or quiet the output. We checked the output wave period as 1000 ms for one toggle cycle (high and low) divided by 2.272 ms = 440 Hz wave form to speaker to make sound. 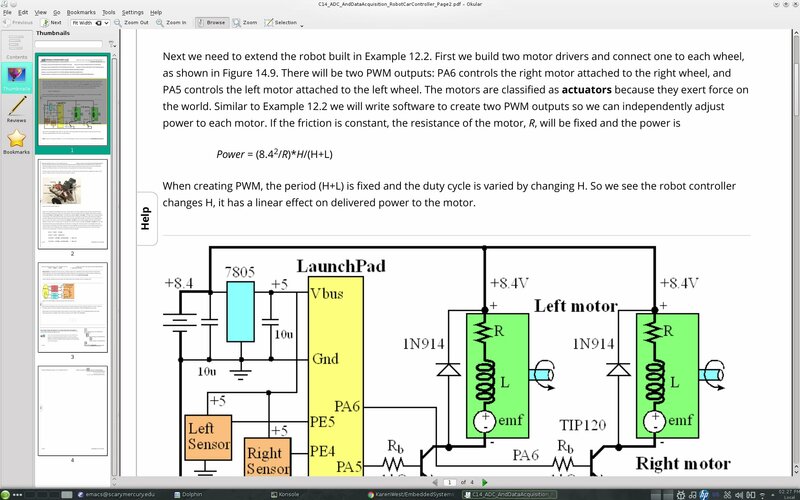 This class example used SysTick interrupts to implement a software pulse width modulted output (PWM) to drive a DC motor at a given duty cycle. The builtin button switch1 (SW1) increases the speed, and switch2 (SW2) decreases the speed. Developed a system that outputted to a DC motor that uses pulse width modulation. We designed and tested a guitar tuner, producing a 440 Hz tone. 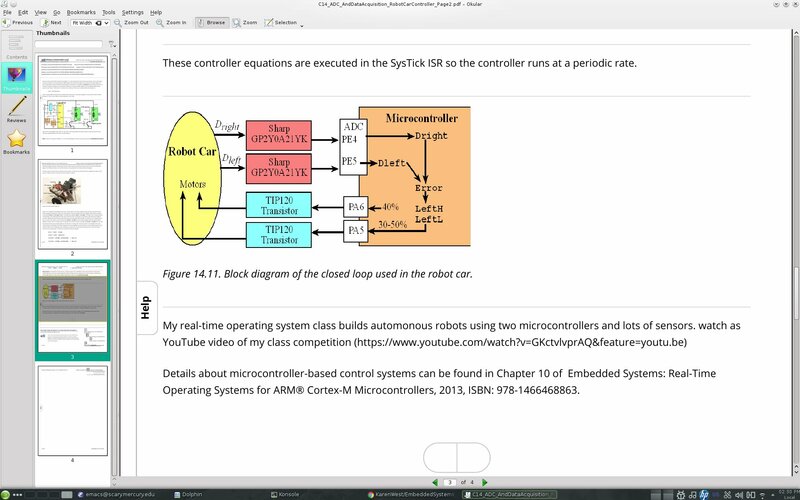 This class example demonstrated how to use the microcontroller board builtin switch button to create a falling edge interrupt. Periodic SysTick Interrupts: This class example used the SysTick timer to request interrupts at a particular period. Being able to dynamically control bus frequency and I/O devices is important for low-power design. The execution speed of a microcontroller is determined by an external crystal. The microcontroller board we used had a 16 MHz crystal. Most microcontrollers include a phase lock loop (PLL) that allows the software to adjust the execution speed of the computer. Typically, the choice of frequency involves the tradeoff between software execution speed and electrical power. In other words, slowing down the bus clock will require less power to operate and generate less heat. Speeding up the bus clock obviously allows for more calculations per second, at the cost of requiring more power to operate and generating more heat. The default bus speed for the microcontroller internal oscillator is 16 MHz ±1%. The internal oscillator is significantly less precise than the crystal, but it requires less power and does not need an external crystal. If we wish to have accurate control of time, we will activate the external crystal (called the main oscillator) to use the PLL to select the desired bus speed. There are two ways to activate the PLL. We could call a library function, or we could access the clock registers directly. To save power, we slow down the bus frequency removing as much of the wasted bus cycles while still performing all of the required tasks. For battery-powered systems the consumed power is a critical factor. The accuracy of SysTick depends on the accuracy of the clock. We use the PLL to derive a bus clock based on the 16 MHz crystal, the time measured or generated using SysTick will be very accurate. More specifically, the accuracy of the NX5032GA crystal on the LaunchPad board is ±50 parts per million (PPM), which translates to 0.005%, which is about ±5 seconds per day. One could spend more money on the crystal and improve the accuracy by a factor of 10. Not only are crystals accurate, they are stable. The NX5032GA crystal will vary only ±150 PPM as temperature varies from -40 to +150oC. Crystals are more stable than they are accurate, typically varying by less than 5 PPM per year. We learned how to implement time delays based on SysTick. The RELOAD register is set to the number of bus cycles one wishes to wait. If the PLL function has been executed, then the units of this delay will be 12.5 ns. Writing to CURRENT will clear the counter and will clear the count flag (bit 16) of the CTRL register. After SysTick has been decremented delay times, the count flag will be set and the while loop will terminate. Since SysTick is only 24 bits, the maximum time one can wait with SysTick_Wait is 224*12.5ns, which is about 200 ms.
To provide for longer delays, the function SysTick_Wait10ms calls the function SysTick_Wait repeatedly. Notice that 800,000*12.5ns is 10ms. What is the longest time one could wait using SysTick_Wait10ms? The maximum delay is 232 * 10ms, which is about 500 days. We learned to use the static timer to get precise delays. Precision like this is required in real time systems where not meeting delays can have consequences, ranging from minor inconveniences to serious catastrophes (air traffic control, nuclear power plants, anti-lock brakes in a car, etc). We learned to build an abstraction called a finite state machine which makes as a design, complex systems using a simple abstraction that lends itself to probability of function. FSMs are a design process that is easy to verify and has a set of theory behind it. The same engine we build for one FSM can be used no matter how complex the system is. An FSM is a 5-tuple: sets of: inputs, outputs, states, transitions (STG = state transition graph, and a matrix can be used too), and output determination. The Moore FSM was the focus for this class, where the next state is a function of current state and input, and the output is a function of the current state. Mealy machines are not covered in this class, but their output is a function of the current state and the input. For the odd ones detector shown in the code link, the input is a bit, either one or zero, as is the output. There are 2 states, even and odd. When in even state and input = 1, you go to odd state where output = 1. When in even state and input = 0, we stay in even state and output = 0. When in odd state and input = 1, you go to even state and output = 0. When in odd state and input = 0, you stay in the odd state and output = 1. This is a very, very simple Moore FSM to demonstrate the concept. The time delay is 1 sec. spent in each state. We designed a traffic light controller for the intersection of two equally busy one-way streets. The Solution: The intersection has two one-ways roads with the same amount of traffic: North and East. We begin the design defining what constitutes a state. In this system, a state describes which road has authority to cross the intersection. The basic idea, of course, is to prevent southbound cars to enter the intersection at the same time as westbound cars. In this system, the light pattern defines which road has right of way over the other. Since an output pattern to the lights is necessary to remain in a state, we solved this system with a Moore FSM. PE1=1, PE0=1 means there are cars on both roads. The next step in designing the FSM was to create some states. We created decision rules defining what to do for each possible input and for each state. If no cars are coming, stay in a green state, but which one doesn’t matter. To change from green to red, implement a yellow light of exactly 5 seconds. Green lights will last at least 30 seconds. If cars are only coming in one direction, move to and stay green in that direction. If cars are coming in both directions, cycle through all four states. This section uses a function variable. For example we defined function variables in this format: "void (*functionPt)(void);"
The design goals were as follows: design a vending machine with two outputs (soda, change) and two inputs (dime, nickel). Our Solution: This vending machine example illustrates additional flexibility that we built into our FSM implementations. Rather than simple digital inputs, we created an input function that returned the current values of the inputs. Similarly, rather than simple digital outputs, we implemented general functions for each state. This approach provided an alternative mechanism when the input and or output operations become complex. Our simple vending machine had two coin sensors, one for dimes and one for nickels. When a coin fell through a slot in the front of the machine, a light from the sensor reflected off the coin and was recognized back at the sensor. An op amp created a digital high at the Port B input whenever a coin was reflected. So as the coin passes the sensor, a pulse (V2) was created. The two coin sensors were inputs to the FSM. If the digital input was high (1), that meant there was a coin currently falling through the slot. When a coin was inserted into the machine, the sensor went high, then low. Because of the nature of the vending machines we assumed there cannot be both a nickel and a dime at the same time. This meant that the FSM input could be 0, 1, or 2. To implement the soda and change dispensers, we interfaced two solenoids to Port E.
If the software made PE0 high, waited 10ms, and then made PE0 low, one soda was dispensed. If the software made PE1 high, waited 10ms, and then made PE1 low, one nickel was returned. Engine Control Mealy Type Finite State Machine (FSM):This used a pointer implementation of a Mealy finite state machine to operate an engine with a control input, gas and brake outputs, and two states. 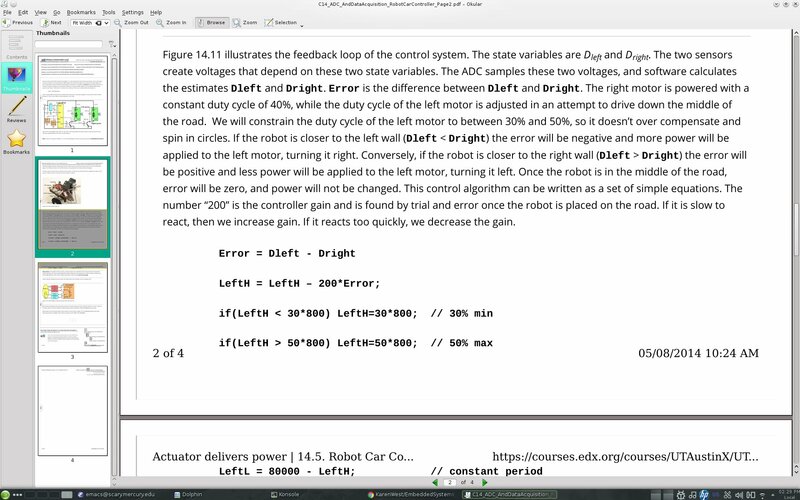 Finite State Machine (FSM) Used to Control a Stepper Motor to a Robot: This is what we learned from this class example. A motor can be evaluated in terms of its maximum speed (RPM), its torque (N-m), and the efficiency in which it translates electrical power into mechanical power. Sometimes however, we wish to use a motor to control the rotational position "(θ=motor shaft angle)" rather than to control the rotational speed "(ω=dθ/dt)". Stepper motors are used in applications where precise positioning is more important than high RPM, high torque, or high efficiency. Stepper motors are very popular for microcontroller based embedded systems because of their inherent digital interface. In this design, the first button made it spin one way, and the second button made it spin the other way, and the third button made it step just once. If both of the first two buttons were pressed, it wiggled back and forth. 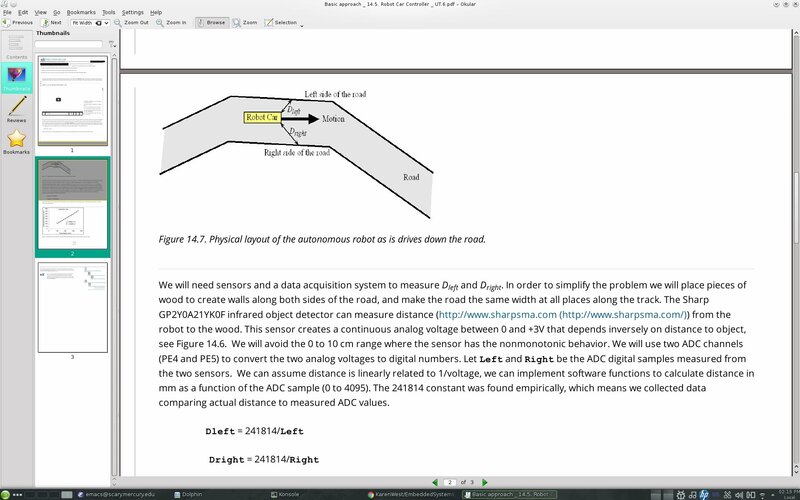 This lab demonstrated how to design a Moore FSM based on lecture examples to control a traffic light. 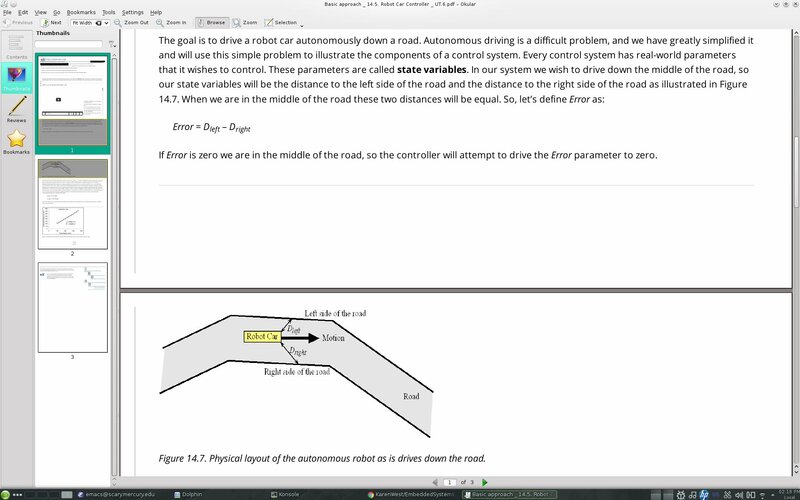 The microcontroller had 3 input sensors, one each indicating cars on the east to west and north to south roads, and one for a pedestrian. There were 8 output LEDs, 3 each for the traffic lights for the east to west and north to south roads, and one each for the walk and don't walk signals. There were 9 states with each output wait time 0.5 seconds. Cars were not allowed to crash, and when the don't walk signal flashed on and off, the pedestrian knew to hurry up and cross. When don't walk did not flash pedestrians knew not to cross. Pedestrians were not allowed to cross when cars were present on either road. If all 3 sensors were on, an output pattern was output to the LEDs for 20 seconds. The system had input independence since each state had 8 arrows to the next state, depending on the input and current state. A Moore machine was used since the LED output pattern was based on what state you were currently in. Arrays and Functional Debugging: Developed a system that debugs by dumping data into an array. The class developed a communication network between 2 LaunchPad boards over the UART channels. The switches were inputs, LEDs were outputs, and UARTs were used to communicate. Information was encoded as colors on the LEDs. There were 5 questions with each question associated with one of the 5 colors. There were 3 answers to these questions associated with 3 other LED colors. Lessons Learned: A communication network includes both the physical channel hardware and logical procedures and software that allow users to communicate with each other. The network provides the transfer of information as well as the mechanism for process synchronization. When faced with a complex problem, one could develop a solution on one powerful and centralized computer system. Alternatively, a distributed solution could be employed using multiple computers connected by a network. The processing elements of a distributed system may be a powerful computer, microcontroller, an application specific integrated circuit (ASIC) or a smart sensor and actuator. Distributed processing places input, output and processing at multiple locations connected together with a network. There are many reasons to consider a distributed system network over a centralized solution. Often multiple simple microcontrollers can provide a higher performance at a lower cost compared to one computer powerful enough to run the entire system. Some embedded applications require input and output activities that are physically distributed. For real time operation, there may be not enough time to allow communication for a remote sensor and a central computer. A distributed system can often be deployed and scaled. If complexity increases, you can add a network node, and vice versa. This code wrote a series of images and text to the Nokia 5110 84x48 graphic LCD. We were told not to drive the backlight with 5V sinec it would smoke. However, the backlight on the LCD seemed to be happy with direct drive from the 3.3V regulator. 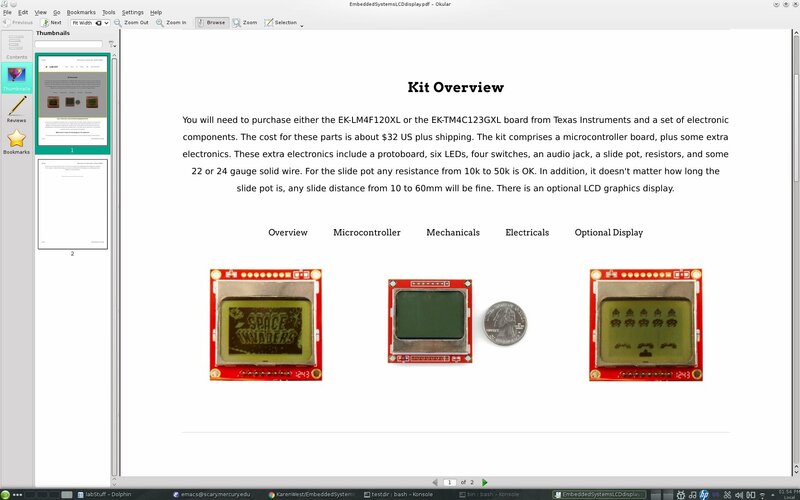 Although the PCD8544 controller datasheet recommended 3.3V, the graphic Nokia 5110 LCD can run at 3.3V or 5V. No resistors were needed on the signal lines. We needed 5 signal lines to connect to the LCD, 3.3 or 5V for power, 3.3V for LED backlight, and 1 for ground. 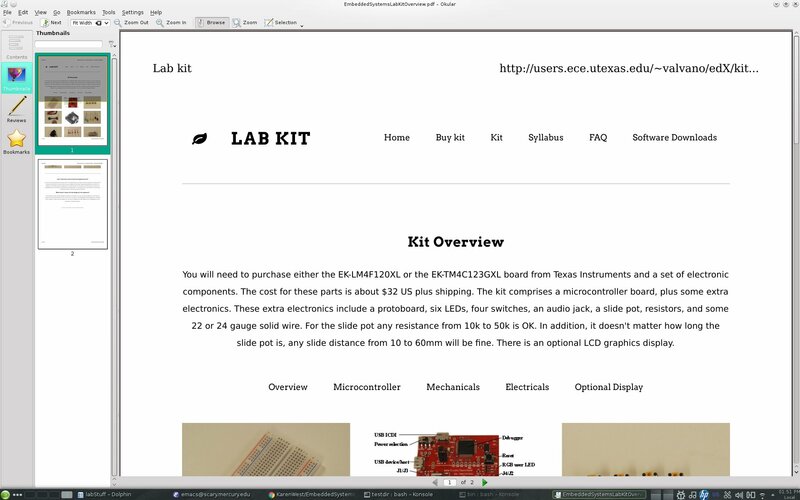 UARTs Lab: Universal Asynchronous Receiver Transmitter: read in a number, converted it to ASCII, and sent it to a display connected to the UART. 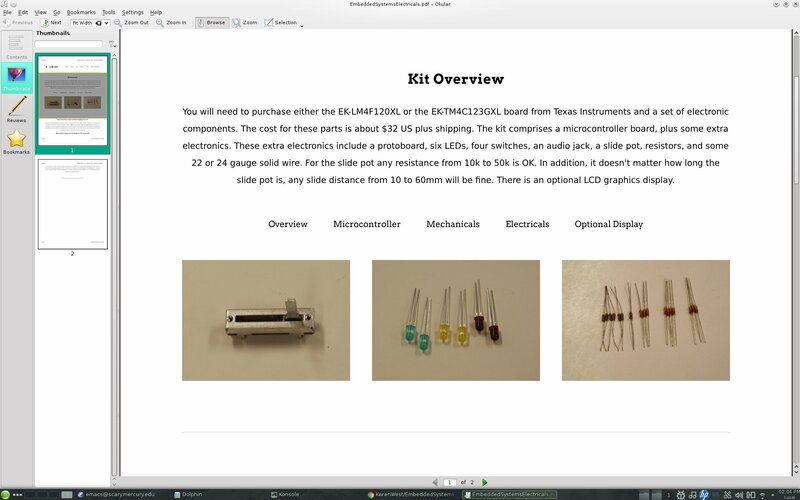 Lessons Learned: Serial Interface and UARTs Lab Functions: UART Universal Asynchronous Receiver Transmitter serial interface. A UART input function accepted ASCII characters from the serial port and adds them to a string until "enter" is typed or until max length of the string was reached. It echoed each character as it was inputted. If a backspace was inputted, the string was modified and the backspace was echoed. It terminated the string with a null character. It used busy waiting synchronization on RDRF. A UART output function outputed a 32 bit number in unsigned hexadecimal format. Variable format was 1 to 8 digits with no space before or after. A UART hex input function accepted ASCII input in unsigned hexadecimal (base 16) format. No "$" or "0x" needed to be entered, just the 1 to 8 hex digits. It converted lower case a to f to uppercase A to F and converted it to a 16 bit unsigned number value range is 0 to FFFFFFFF. If you enter a number above FFFFFFFF, it returned an incorrect value. Backspace removed the last digit typed. The UART output function for decimal numbers outputted a 32 bit number in unsigned decimal format. Variable format was 1 to 10 digits with no space before or after. A UART Input function for decimal numbers accepted ASCII input in unsigned decimal format and converted them to a 32 bit unsigned number with the valid range from 0 to 4294967295 "(2^32-1)". If you enter a number above 4294967295, it returned an incorrect value. Backspace removed the last digit typed. The UART output string function outputted a null terminated string. The UART character output function outputted an 8 bit character to the serial port. The UART input character function waited for a new serial port input. The UART input function waited for a new serial port input. The UART Init initialized the UART for 115,200 baud rate (assuming 50 MHz UART clock), 8 bit word length, no parity bits, one stop bit, and FIFOs enabled. Goal of course: to put together all that we learned in an old fashioned video game from the 1970s and 1980s, Space Invaders, which was optional and I did not do, but may do someday! Here are some details about that. 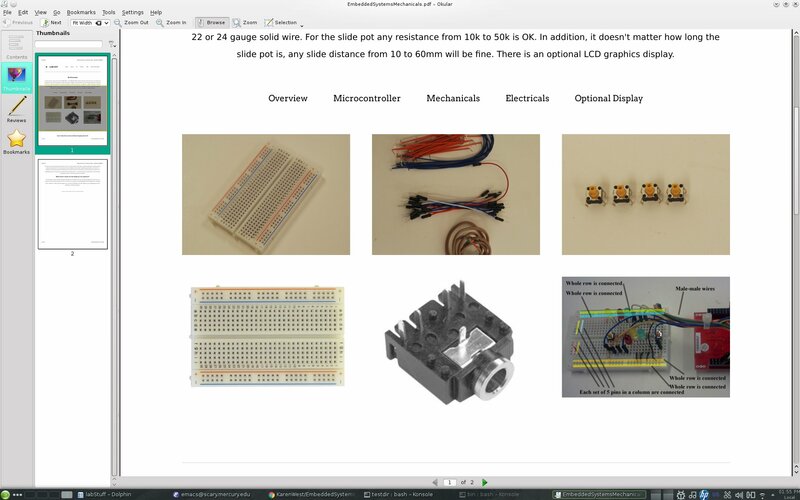 Link to embedded systems class files for final project that we were given to evaluate. Project was optional, so I evaluated without putting all my labs together here. 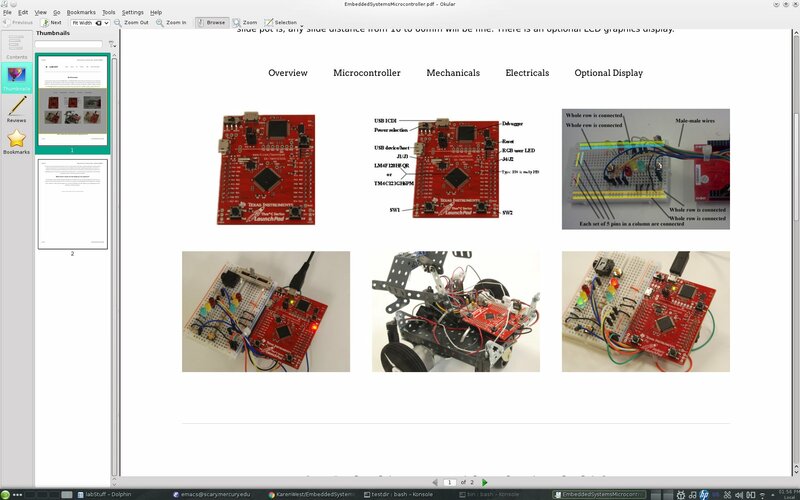 Hardware: ARM based microcontroller board (LaunchPad) and a simulator (from professors). Game controller hardware involved was a slide potentiometer, 2 switches, 2 LEDs, resistors to interface to the switches and LEDs, and a mini display. Images of the space invaders, space ships, lasers, bunkers, etc, were 2 dimensional arrays. Microcontroller timers were used for periodic interrupts. The DAC (Digital to Analog Converter) was used to make sound. Graphics were displayed on the mini display LCD. Programming involved: timers, interrupt service routines, the Analog to Digital (ADC) Converter, and device drivers for the DAC and LCD. 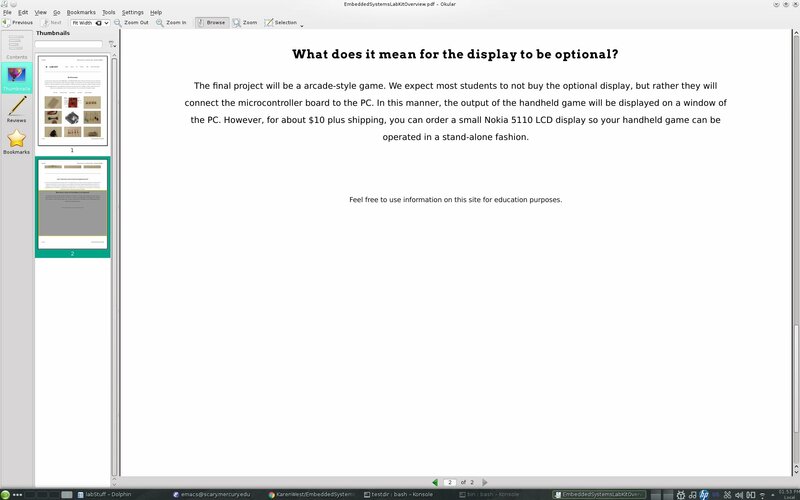 Professors provided some code: interfacing the graphics to the mini display. Audio files: were provided and a DAC was used for making sounds to a speaker or headphones connected by an audio jack. Main game engine: ran in an infinite loop, interrupted by 2 interrupt service routines (ISRs). the explosion sound array to the speaker or headphone. Timer2A ISR this interrupt service routine ran faster than SysTick ISR. It ran at 11,000 times per second (as opposed to 30 times per second for SysTick ISR). Timer2A ISR was 11KHz, but SysTick ISR was 30Hz. Graphics (space invader enemies, player ship, etc):movements were put into a buffer, but the main game engine outputed them to the LCD display, (was time consuming).